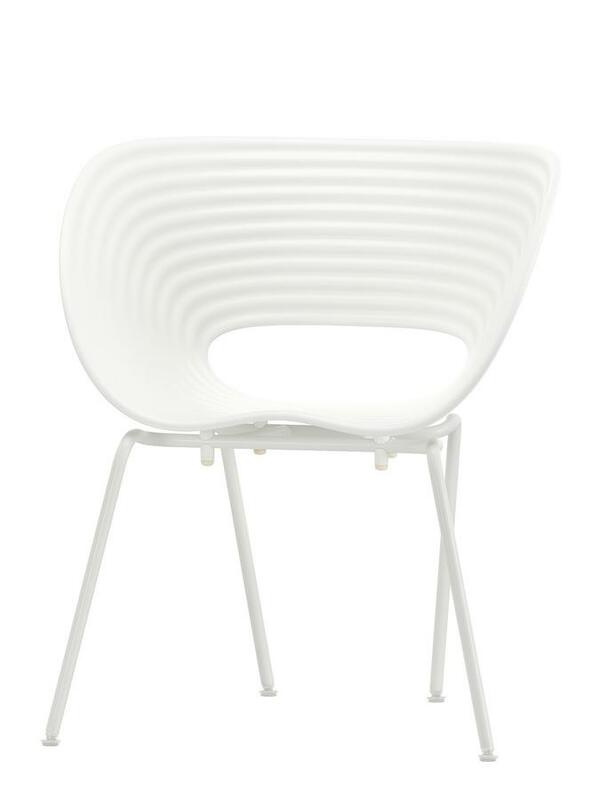 The Vitra multi-purpose chair Tom Vac by Ron Arad with its powder-coated base and the special additives in the seat shell which protect against fading from UV light is a real eye catcher indoors and out. 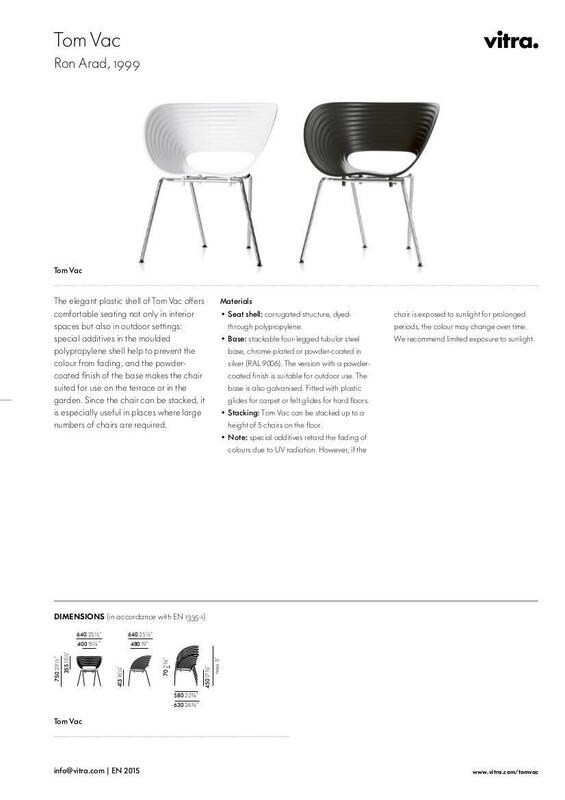 Specifically, the Tom Vac is defined by its asynchronous legs and the curved seat shell with its pleated surface; a construction which allows for a high level of seating comfort. 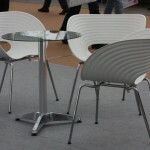 Care For cleaning the plastic seat shell a soft, damp cloth and a mild, non-abrasive detergent is recommended. Subsequent careful drying is also recommended. 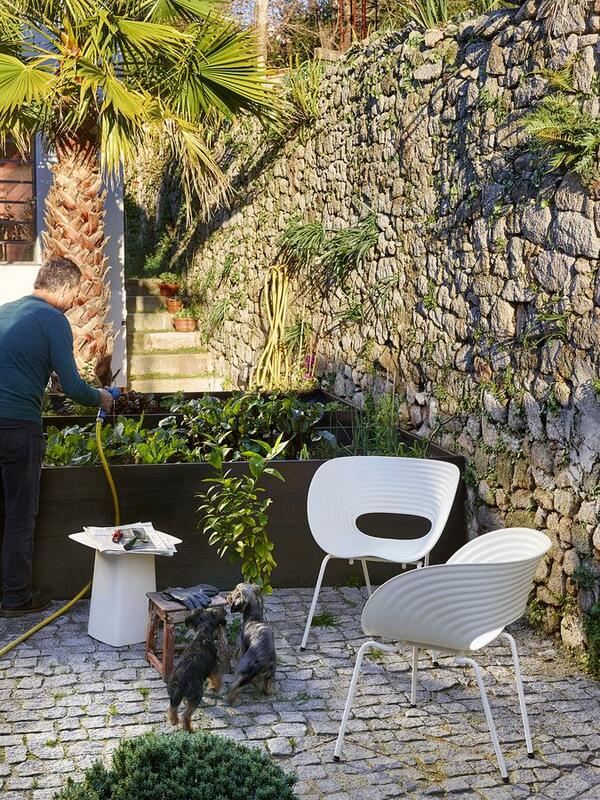 Tom Vac, the satellite-esque Vitra chair for home and garden, with its asynchronous legs and curved, oval seat with pleated surface structure is the extraterrestrial high flyer in the seating universe. 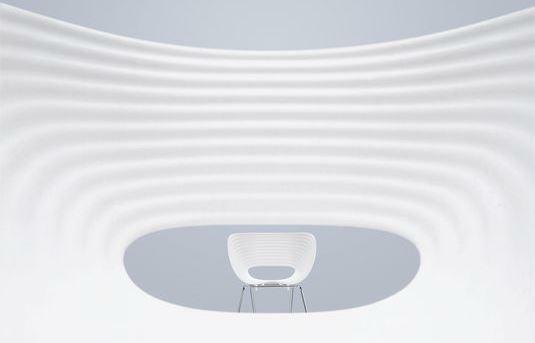 The shell-shaped seat welcomes the sitter and makes Tom Vac that what ultimately matters most - a comfortable place to sit. 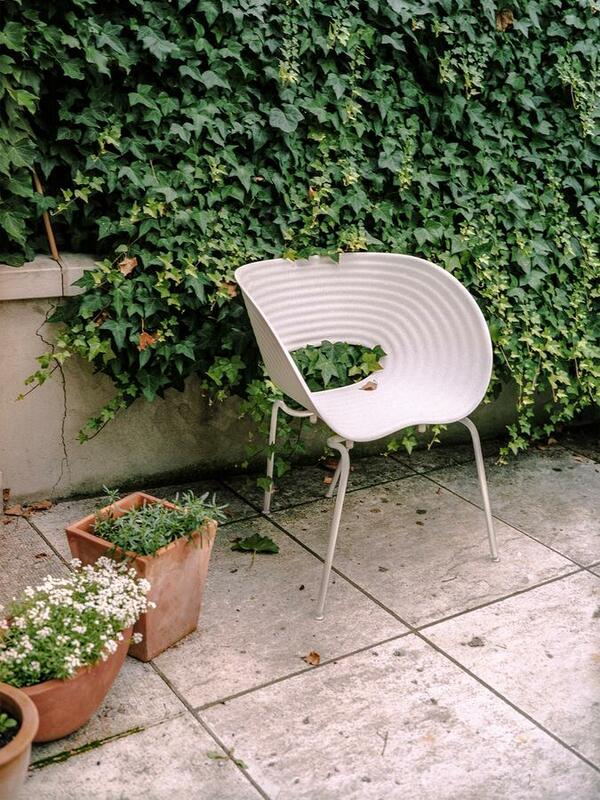 Thanks to special additives in the plastic the seat shell is particularly durable and suitable for outdoor use, the powder coated legs ensuring the base is as durable as the seat. 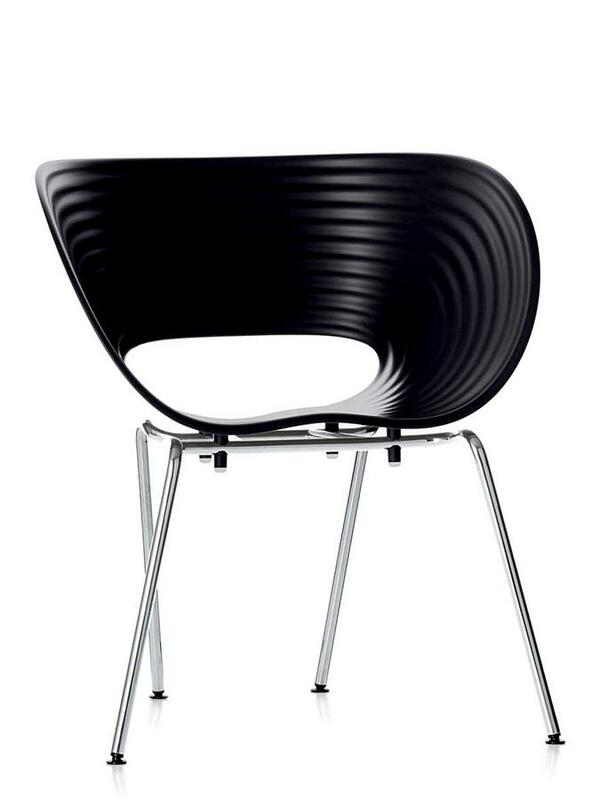 As such designer Ron Arad has thus created a general purpose chair, which can be used in numerous situations with an unflinching ease. 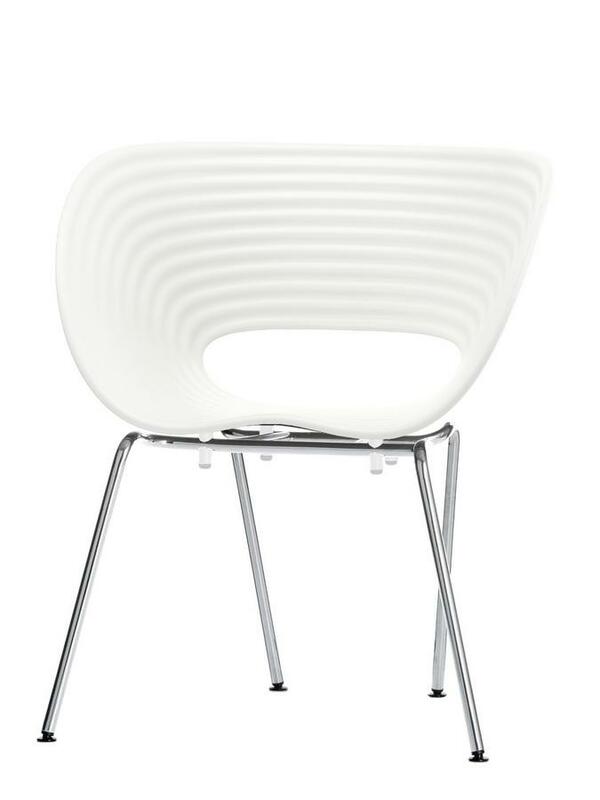 In particular for public seating the stackable Vitra Tom Vac offers a clever solution that combines a modern look with a durable design. 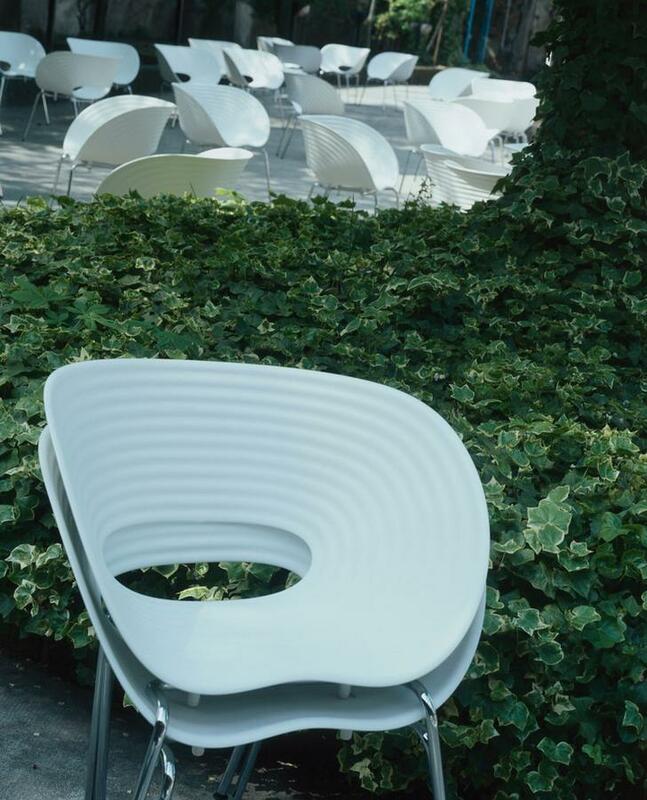 Tom Vac is thanks to special additives in the plastic of the seat shell and its powder coated base particularly suitable for outdoor use. The designer of the Tom Vac is the British/Israeli architect and industrial designer Ron Arad. Born in 1951 in Tel Aviv as the son of a photographer and a painter, he began to study at the Academy of Art Tel Aviv in 1971 before moving to London in 1974 to study architecture. 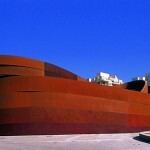 In the late 1980s Ron Arad and Caroline Thorman founded the architecture and design agency Arad Associates. The beginning of his design career was marked by the Rover Chair, which he developed in 1981 and which with its use of ready-mades in furniture design broke with the popular conventions of the day. 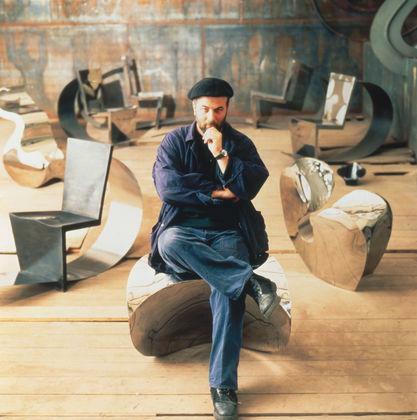 Between 1997 and 2009, Ron Arad was head of product design at the Royal College of Art London. Ron Arad's work covers many different areas of industrial design and in addition to furniture he has developed, for example, a perfume bottle for Kenzo and designed a chandelier for Swarovski 2005. 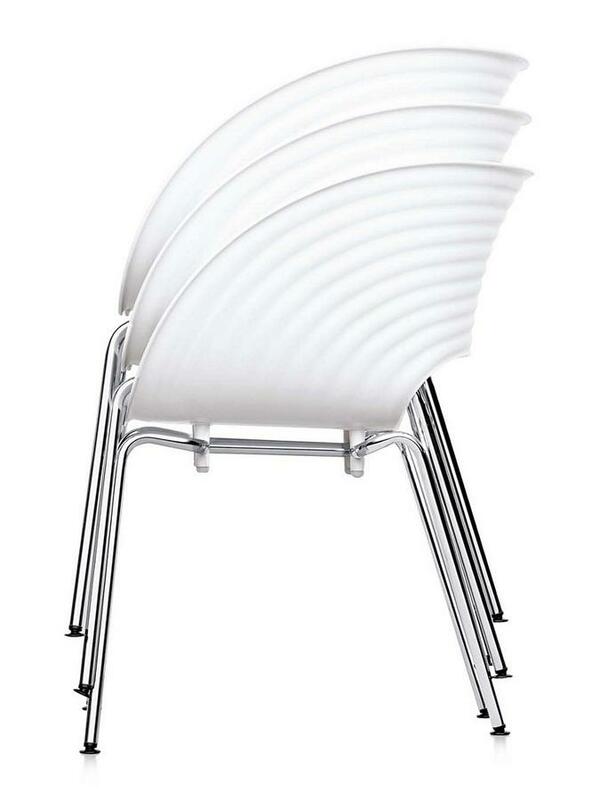 The design of Ron Arad's Tom Vac is distinguished by the characteristic oval shape and the wave-like pleated surface. 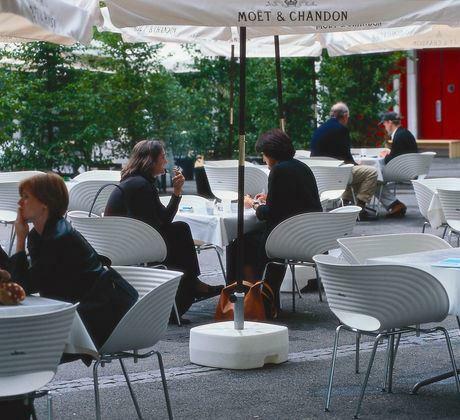 Ron Arad's plastic Tom Vac chair has been produced by Vitra since 1999, and is optionally available with either a white or black through-dyed polypropylene shell and a range of bases: an elegant polished chrome version or matt powder coated version suitable for outdoor use. True to Vitra's principle of providing long life, durable products, all materials use din the construction of the Vitra Tom Vac are characterized by their high quality and are subjected to strict controls before and during production. The final product is then tested to stimulate 15 years use. And when, should, your Tom Vac need to be recycled by careful and complete separation of the various components the Vitra Tom Vac is 100% recyclable. With headquarters in Switzerland Tom Vac manufacturer Vitra is one of the leading producers of designer furniture in the German-speaking countries. 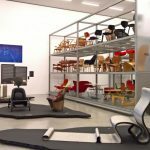 This success is the result of a now an almost 70-year history, and path paved with the genuine classics of furniture design and bold innovations: Vitra is not only responsible for bringing many Herman Miller design classics from the US to Europe, but, for example, cooperated with Verner Panton in the development of his Panton Chair. 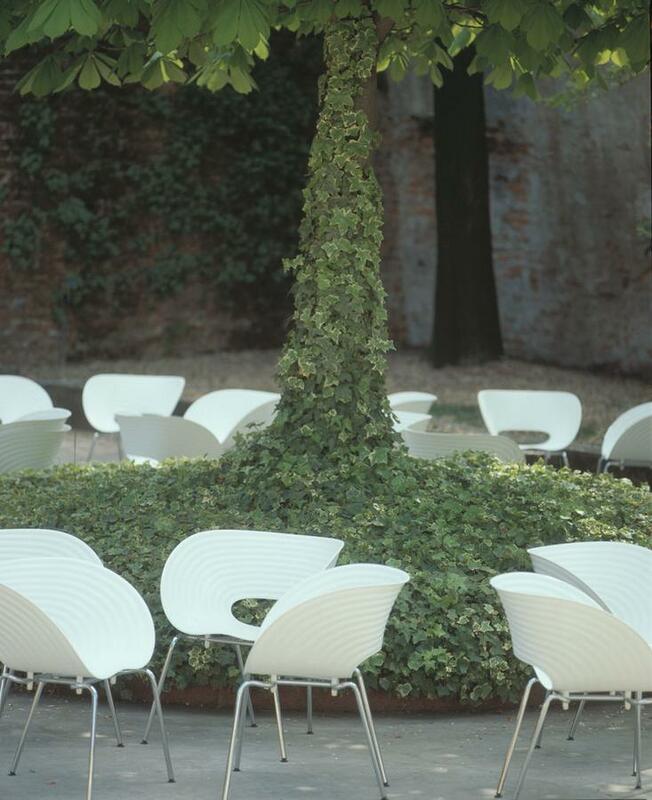 The Tom Vac is one of the more recent successes in the Vitra portfolio and represents the modern image of the popular furniture manufacturer. 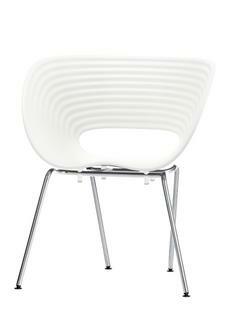 Vitra makes designs with a unique, fresh look that are both aesthetically pleasing and a functionality useful. 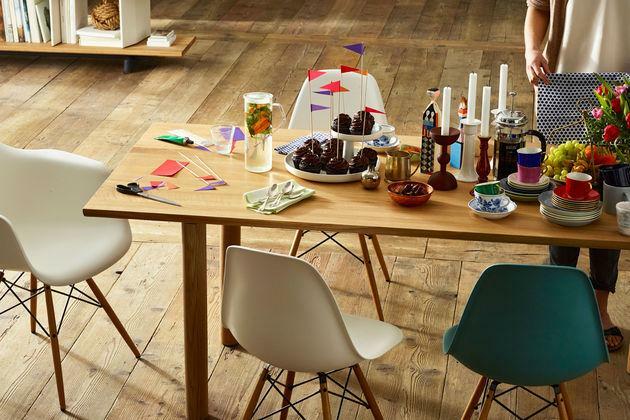 Whether classics such as the Eames chairs or design innovations such as those from Arad, Bourroullec & Co., with Vitra stylish living and working spaces are guaranteed. Tom Vac by Ron Arad for Vitra. 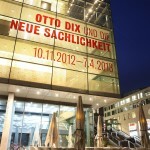 And New Objectivity!